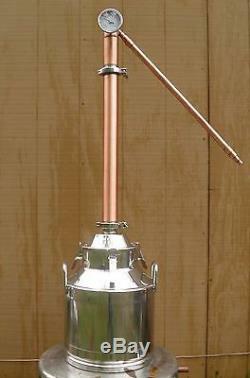 5 Gallon Heavy Duty Stainless Steel Still with a 2 Copper Reflux Column. This still can do it all Vodka, Rum, Whiskey, E-85 Ethanol and Distilled Water. It can be ran in pot still mode for Whiskey and Brandy or it can be ran in reflux mode for Vodka or E-85 ethanol. You can fire it with a Propane Burner. The reflux column has it's own built in condenser. This still is made with high grade, polished stainless steel, and copper using sanitary TIG welded construction. The boiler stands at 17 1/2" tall, and is 12 5/8" in diameter. The bottom of the boiler is flat and recessed. This still also comes with. Top quality construction with beautifully rounded curves. The still boiler is built from heavy gauge 304 food grade stainless steel. Polished to a mirror finish inside and out. Thermowell and commercial grade thermometer with 3 face. Copper packing for the column. Reflux column will produce up to 190 proof. The 24 gauge copper stills that you see elsewhere on the internet are so thin that you can take your hands and crush them like a huge beer can. The Chinese stainless stills and the stills made from cook pots are even worse. The stainless in them is as thin as paper. If you flip a 24 gauge copper still or one of the cheap stainless stills with your thumb and fore finger it will make a dent. If you punch this stainless milk can boiler with your fist, you might break your fist but there won't be a dent. My stills and still boilers are made from heavy gauge stainless and are built to last a lifetime. Hand it Down to Future Generations! The item "5 Gallon Moonshine Still with 2 Copper Reflux Column, Vodka E-85 Ethanol" is in sale since Wednesday, August 31, 2016. This item is in the category "Home & Garden\Food & Beverages\Beer & Wine Making". The seller is "affordable-distilling" and is located in Doniphan, Missouri. This item can be shipped to United States, Canada, United Kingdom, Denmark, Romania, Slovakia, Bulgaria, Czech republic, Finland, Hungary, Latvia, Lithuania, Malta, Estonia, Australia, Greece, Portugal, Cyprus, Slovenia, Japan, China, Sweden, South Korea, Indonesia, Taiwan, South africa, Thailand, Belgium, France, Hong Kong, Ireland, Netherlands, Poland, Spain, Italy, Germany, Austria, Israel, Mexico, New Zealand, Singapore, Saudi arabia, Ukraine, United arab emirates, Qatar, Kuwait, Bahrain, Croatia, Malaysia, Brazil, Chile, Colombia, Costa rica, Panama, Trinidad and tobago, Guatemala, Honduras, Jamaica, Bahamas, Viet nam, Uruguay.